it’s Kimberly with Get Away Today, where we specialize in Disneyland vacations. In my opinion, nothing can make or break a vacation more than picking the right or wrong hotel. And I believe that so much of being happy with your hotel is making an informed choice. When you know what questions to ask, you can manage your expectations. I enjoy things so much more when I know what to expect! We work with over 50 hotels near Disneyland and I have personally stayed at quite a few of them. I’ve also been able to go to Anaheim and visit each of the hotels we work with during our annual Familiarization Trip. The FAM Trip is a week long trip touring each of our hotel and attraction partners. This helps our agents give you personalized recommendations based on what you are looking for. It’s amazing how much variety there is between properties. To help make your decision a little bit easier, I’ve put together 14 questions to ask yourself when booking your hotel near Disneyland. How far is it from Disneyland? This is one of the most common questions we get asked at Get Away Today. I generally recommend hotels that are within two miles of the parks. There are a few exceptions, but how far your hotel is from the Resort relates to how long it will take you to get to and from the parks. Because of traffic and logistics, a hotel a few miles away can turn into a 30 minute commute to and from Disneyland! How will I get to Disneyland? Depending on how far your hotel is to Disneyland, you can walk, take a shuttle or park. If you are close enough to walk, that’s going to be the easiest, of course. If you’re staying within a two mile radius of Disneyland, it’s likely that your hotel uses either the ART or PCA shuttle. That’s going to be the second easiest way to get to the parks. If you park, you’ll want to be aware that Disney recently updated their processes, so you’ll go through security before leaving the parking garage. It pays to arrive at Disneyland before the gates open, and having a quick breakfast at your hotel can help get your family out the door faster. If having breakfast is important to you, you will want to make sure that your hotel offers a breakfast, or at least has a refrigerator so you can keep some milk and cereal on hand. Having or not having breakfast may not be a deal breaker, but if your hotel doesn’t serve it, you may want to grab some breakfast bars or juice for the morning. When it comes to hotel breakfast, not all are created equally. There is a big difference between a continental breakfast which may have a danish and some coffee, and a full breakfast buffet. The Embassy Suites offers one of the best in my opinion with a wide array of options and a cook-to-order omelet station. Again, it’s all about setting and managing expectations. How many people can sleep comfortably in the rooms? There is a difference between maximum occupancy and who can fit comfortably in a room. The maximum occupancy is generally determined by fire codes and has little to do with comfort. Just because you can fit five people in a room doesn’t mean there’s a bed for everyone. If you have really young kids, two queen beds may be just great for your family. But if you have three big teenagers, it may feel cramped. Some hotels allow roll-aways, and some don’t. If you are traveling with more than four people, you may want to look at staying in a suite for some extra space. This is something I totally used to not think about. I am 5’ 2”, but my husband is 6’ 4”. To him there is a huge difference in comfort between a double and a queen sized bed. Ever since we’ve been married, I’ve paid much closer attention to the bedding types in hotel rooms. Some hotels in the Disneyland area even have rooms that offer bunk beds. These are obviously a huge hit with kids! There are few vacation disappointments more disappointing than getting your kids psyched and ready for the pool, only to find out it’s closed! Many of the hotels in Anaheim have longer pool hours, and a few even have 24 hour pools. Many hotels in tourist areas and big cities charge for parking. Anaheim is no exception. However, Get Away Today has negotiated free or reduced parking rates at many of our partnered hotels. A parking fee doesn’t have to be a deal breaker, but it is always better to know about parking fees beforehand instead of being surprised by an extra charge at check-out. Resort fees are also gaining popularity in Anaheim. Once again, Get Away Today has negotiated waived or reduced resort fees at many of the hotels around Disneyland. Like parking fees, resort fees don’t have be a deal breaker, but you want to know about them when booking so you can make a true price comparison between other hotels. If so, what does the resort fee include? There’s no standard for what a resort fee includes. In some cases, a resort fee may cover your parking and/or in-room Wi-Fi. At another it could include your shuttle to and from Disneyland. Verify beforehand so you know exactly what your resort fee covers if you choose a hotel that charges one. Am I guaranteed a non-smoking/smoking room? All of our agents are trained to say, “All requests are subject to availability at the time of check-in.” A smoking or non-smoking room is one of those requests. I personally love that so many of the hotels in Anaheim seem to be moving towards 100% non-smoking. Even if it’s not 100% non-smoking, most of the hotels near Disneyland have a small percentage of smoking rooms. If you’re traveling with a smoker, that may not be ideal for your situation. If you are traveling with anyone with allergies or asthma, and require a non-smoking room, you’ll want to find out what percentage of the hotel is non-smoking. Also, be sure to make a medical request if you require it. Does the room have a fridge? Whether or not your room has a fridge can make a big difference in convenience and saving money. I love having a few cold drinks and snacks in my room – especially with kids! However, a fridge is a necessity if you have medications that require refrigeration. If so, be sure to make note of that when booking a room. Does the room have a microwave? Having a microwave can be great if you are trying to save money on eating out. You can take leftovers from a restaurant and reheat them later, or even grab a few microwavable items from the grocery store. If you want to do a movie in, you can always pop popcorn. Check-in times vary, but a general rule is check-in is around 3:00pm and check-out is around 11:00am. Some hotels allow early check-in or late check-out based on availability, but it is never a guarantee. If you are traveling during a busy season, I wouldn’t expect it. Almost all hotels will hold your luggage at the front desk if you want to spend the day at Disneyland before checking in or after checking out. I hope this helps you narrow down your choices and set your expectations for a hotel near Disneyland. 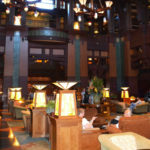 Allison has recently stayed on-property at the Grand Californian and off-property at the Anaheim Hilton Garden Inn, which is just down the street. Both are good options! Click the links to read her reviews. Want the best price on a Disneyland hotel and tickets? I recommend Get Away Today, of course. Nobody knows Disneyland better, and if you find a better price on the same package, we’ll beat it by $10. I love your posts, but I have a question I can’t seem to find an answer to anywhere online: obviously, the earlier you can book a Disneyland-area hotel, the better, but how late in your opinion is too late to try to book a room, if you want to stay somewhere within easy walking distance? In particular, if you’re looking at visiting in late fall/early Christmas season? Thank you for asking about this for me! I guessed (or at least hoped!) the answer would be less than a year, but it’s very good to know that a month out should still be feasible. So glad to help! There are so many hotels near Disneyland that there are nearly always empty rooms for last-minute trips. However, the best rooms in the best locations for the best prices do fill months in advance, so it pays to book sooner when you can. Now is a great time to shop hotels for a late-2018 trip. 🙂 Happy planning!